Broad Assortment Includes Unique Items like Disney® Tsum Tsum for Pets; Holiday Pet PJs, Perfect for Christmas Morning Photo; Santa Claus Costumes; Ugly Sweaters and Winter Accessories like Scarves and Cozy Hats; Classic and Food-Themed Pet Toys; Holiday Cookie Treats and More! BURLINGTON, ON--(Marketwired - November 17, 2017) - According to a national survey by PricewaterhouseCoopers, Canadians are planning to spend an average of $1,507 each this holiday season, with the majority of that spending going toward gifts. PetSmart is well prepared with a robust Holiday Collection in stores now, featuring everything a pet parent might want to bring their pets into the festive spirit of the holiday season. "The holiday season is full of celebrations and rich traditions for all of us -- including our pets," said John DeFranco, president, PetSmart Canada. "PetSmart is the go-to destination to ensure your pet is a part of all your holiday traditions. From stocking stuffers to fun costumes for holiday parts to grooming for those special family photos, our Holiday Collection has all the goods to bring pets into the celebration of the season." Toys make the classic holiday gift! Disney® "Tsum Tsum" is at PetSmart this holiday season. This popular plush human toy is now available for the first time for pets. These lovable characters -- including Eeyore, Stitch, Mickey Mouse and Tigger -- come in a variety of sizes and are complete with squeakers to enhance pet engagement. They make a great pet stocking stuffer! Food-themed pet toys have been a key trend all year and are also popular for the holiday season, including this fast-food holiday four-pack. Tech gadgets are always a crowd pleaser. An exclusive at PetSmart, the pet tech G.O.A.T. Wireless Bluetooth Speakers make a great gift for pets and their humans. These tiny speakers come in four pet-themed shapes, like this spotted dog, and are easy to use. They include a Bluetooth connect, stream music, and include a built-in microphone, selfie remote button, LED light and instructions for an easy app download. The speaker securely clips to any collar, leash or pet-parent. Pet treats are the perfect holiday indulgence. The PetSmart treat assortment ranges from savory to sweet, including the Simply Nourish Turkey Day entrée, and frosted Ho Ho Ho cookies and peppermint cookie dog treats that look so good people might even take a bite. New collar classics. A festive holiday collar is a great pet gift for the holiday season. This collar features a jingle bell so pets can create a delightful jingle as they prance and play. This ED Ellen DeGeneres collar features a chic checkered design with a pop of red. 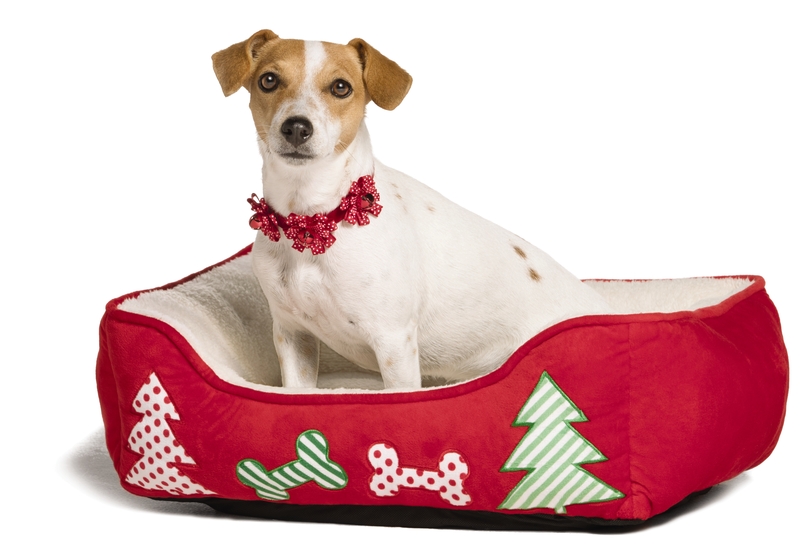 A new holiday-themed pet bed is the perfect gift for your pet and you! Choose from a festive cuddler style featuring a colorful string of lights or this cozy buffalo plaid bed from Beaver Canoe's exclusive-to-PetSmart Canada collection. Fun apparel and décor includes these "Santa's Little Yelper" PJs and this festive elf sweater. The fun doesn't stop at cats and dogs. PetSmart has more than half a dozen offerings for small pets, including an elf costume and reindeer sweater for guinea pigs. For our friends with fins, choose from a variety of festive tank ornaments for your fish like a snorkeling Santa. Fish make great first pets, too! Continuing the tradition, PetSmart offers holiday products that give back to pets in need. Items in the Holiday Philanthropic Collection include classic collectible plush toys, Lucky, Hope and the exclusive-to-Canada Stanley, donning a hockey jersey. The collection also features 12 pet-themed throws with sayings like "I Whine, She Wines" and "Drinking Buddies" and gift cards that give back. PetSmart will donate 10 percent of the proceeds from the sales of these items to PetSmart Charities of Canada to help pets in need. Last year across North America, this program raised $585,000 for the nonprofit organization, and local stores conducted toy drives with the plush toy collecting more than a million toys to give to children in need in the local area. This toy drive effort continues this holiday season. When you buy a bag of dog or cat food through Dec. 31, 2017, PetSmart will give a meal to a pet in need. PetSmart launched the Buy a Bag, Give a Meal program in celebration of its 30th anniversary in March of this year, and expects 60 million meals donated under this program -- the biggest philanthropic campaign in its 30-year history. Help get your pup photo-ready with a haircut, blow-out, nail trim and bath with pampering "spaw" treatments featuring great-smelling products like CHI for pets. Many grooming services also include a festive bandana featuring reindeers, classic plaid and snowflake designs. Apparel and accessories to perfectly style your pet for the holidays include the reindeer antler headband, Santa Claus hoodie costume, a wintery polar bear sweater from the exclusive ED Ellen DeGeneres Collection, a classic scarf, hats including the sock monkey or buffalo plaid treatment, Santa bearded hat, and this small animal hat costume, perfect for guinea pigs and other small four-legged family members. Bring out the entire family, and of course the well styled four-legged family members, for a festive holiday photo with Santa Claus. PetSmart is offering two photo op weekends and will have Santa on hand for photos at all stores Dec. 9-10 & Dec. 16-17, noon - 4 p.m. local time. For more details on the PetSmart holiday collection, check it out at the PetSmart Gift Guide. About this company PetSmart Canada Inc.
PetSmart, the leading pet specialty retailer in North America, is making this holiday season merry and bright with the launch of its Holiday Collection. Items include hundreds of new, on-trend seasonal apparel and accessories as well as toys, pet beds, stocking stuffers, holiday cookie treats, fish tank ornaments and more! The Holiday Collection includes a line of philanthropic items - gifts that give back to pets in need. The PetSmart Holiday Collection is available now at PetSmart stores across Canada and at petsmart.ca.